Stop deportation - Abolish the Dublin System! Freedom of movement for all! Support needed! Who is coming to Munich? We want to protest together against deportations and the Dublin-system. They destroy human dignity. In the German asylum system and the Dublin-System there is no freedom of movement. People are prisoners without freedom. This life destroys the mental health of the people and leads them into prostitution and criminal act." Refugee protest against deportations and for the abolition of Dublin deportations in public interest and for security!! 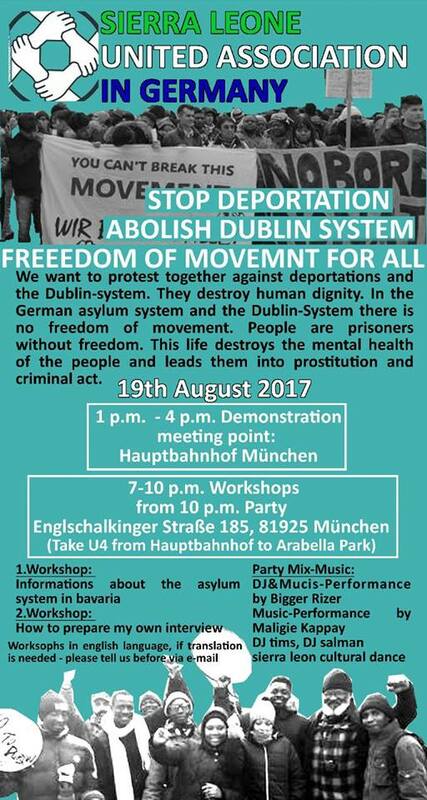 - We want to protest together against deportations and the Dublin-system! 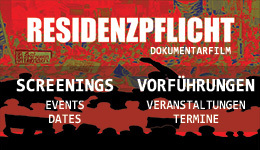 Refugee Resistance and Protest Against Deportation for the Dignity of humans and for our Security in Germany. We joined the Organizers of Sierra Leone United Association in Germany's demand to stop deportations and abolish the Dublin System: “Freedom of movement for all!" We are resisting the injustice of deportation. We are collectively criminalized as refugees to become the crimes of deportation regimes in Europe because being a refugee is already a crime. We are criminalized to be deported before they know our names in forced return deportation. Stop Deportation and Stop Dublin Deportation Policies! Break Deportation for Freedom of Movement. Our freedom is a movement. Use your rights to freedom of movement! All activists that are against deportation are invited to support our protest against Deportations for public interest and security!! Stop deportations! Abolish the Dublin System! Freedom of movement for all!